The Ducati repair and service manuals we offer, are the best available. Intended for do-it-yourself "weekend" mechanics, they feature easy-to-follow, step-by-step procedures, that allow you to repair, service, maintain — even completely rebuild — your Ducati Twin or Single motorcycle like a pro would. Fix your Duc with a DIY manual! Ducati motorcycles are great machines, and as such, they deserve to be treated properly, and that includes regular maintenance such as changing the oil and filter, air cleaner element, spark plugs, etc. The Motor Bookstore offers several repair and service manuals that will allow any hands-on Ducati owner, to perform his or her own maintenance, service or repairs on the bike. The Ducati repair workshop manuals we sell, can help you do all that and more, do it right, and save money in the process. Above: Charlie Kershner is a freelance photographer and a motorcycle enthusiast. 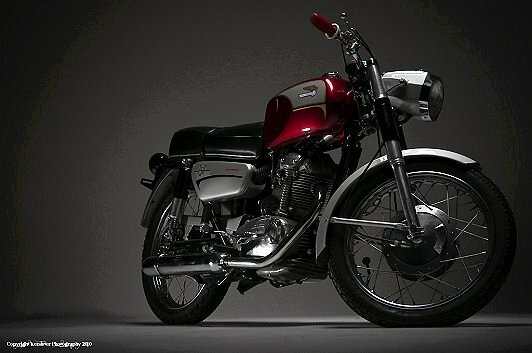 He restored this gorgeous 1967 Ducati Monza 250 a few years ago. Charlie owns 5 bikes, including 3 Ducatis that he races, ride on the street, and keeps in his living room, plus 2 early 1970s Hondas, one a CB450 that he's building into a cafe racer. Washington, D.C.